Did you ever wonder what life would have been like if things were just slightly different? Like… what if your father was actually a member of a mysterious ancient race of people and you found yourself floating around in space in a possibly energy-and-consciousness star vessel and, through an haphazard pickpocketing, you found yourself in the midst of a global conflict and allied with a truly unexpected array of alien beings as it was up to you to stop a monstrous destroyer from doing his worst on an entire planet? Maybe one of your friends could be a raccoon. Or a tree! Sounds impossible, right? 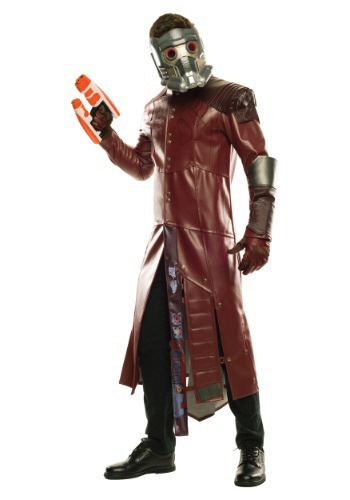 It is time to channel your spirit in the sky and don the augmented helm of the Star-Lord, himself, and do your part in saving the galaxy with this officially licensed Grand Heritage Star Lord costume. The long faux leather coat fastens with metal snaps in the front and has strong foam gauntlets to give you that extra protection from wandering laser fire. The molded plastic mask is shockingly comfortable despite its frightening appearance—made all the more so when two 1.5 volt button-batteries make the exterior eyes glow! Make sure you don’t leave the ship without a couple elemental blasters, because you never know what dangers might await you. Fear not, though. You’re Star-Lord and nothing can go wrong so long as you have your walkman and Awesome Mix!